1. Restrain/Muzzle the dog: Wounds can be painful causing dogs to lash out, biting on instinct, to protect the injured area. For your protection and theirs, you must be prepared to restrain or muzzle the dog. 2. Wound Irrigation: This involves the flow of clean water to remove dirt and bacteria. 3. Removing foreign materials: This should be done with caution. To the untrained eye it is often hard to discern what should and shouldn’t be there. If you can discern what doesn’t belong in the wound, carefully remove the debris with tweezers. 4. Apply pressure: If the wound is open and bleeding it is important to stop or slow the flow of blood. This can be done with a pressure dressing. A pressure dressing is several sterile gauze pads placed over the wound and held in place with direct pressure for 5-10 minutes. (In an emergency you can use a clean shirt or cloth.) DO NOT remove the dressing; instead bandage snugly. 5. 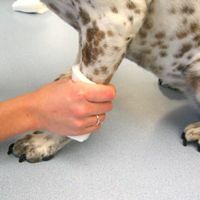 Bandaging: This protects the wound from dirt and bacteria. 6. 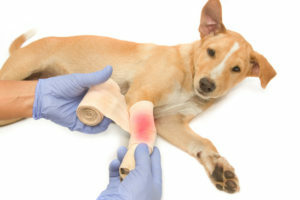 Visit the veterinarian/emergency animal hospital: Once the animal is stabilized and can be moved, contact your veterinarian or go to the local animal shelter to get the wound assessed and treated. Remember, animals can sense fear and anxiety, so remaining calm is the best way to help an animal with an injury. 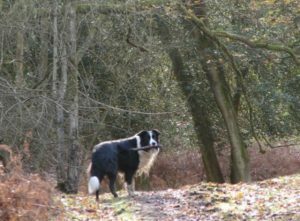 You are the best chance that the animal has at recovery, so concentrate on the animal, assess the injury, and treat it properly. Make sure to keep your emergency kit stocked and handy to ensure that you are ready for any situation.